How do I navigate through my posts in Fieldlens? Every job you're on involves a lot of communication and documentation of what's happening -- that day, every day. The back and forth, Q&A, work being assigned and completed, pictures, updates, etc. In Fieldlens, that communication is captured in posts. And before long, there will be a lot of them within your project. Luckily, you have plenty of options to always find what you're looking for. Fieldlens will even surface the most important information from the job -- without you having to look for it. Fieldlens lets you look at different types of posts using quick filters -- accessible within each project on both web and mobile. At the top of your screen (top left on the web) you'll see your project's name, and just under that is the name of the quick filter you're currently viewing (typically Everything) with a count of posts within that view. Simply click the quick filter name to switch up your view. Daily report - posts created that day. Punch lists - open posts flagged as deficiencies. Safety report - open posts flagged as safety issues. RFI lists - open posts flagged as RFI. Submittal lists - open posts flagged as Submittal. Your personal to-do list - posts assigned to you. Posts assigned by you - to other people or companies, or to yourself. Your company's to-do list - things assigned to your company. At-risk posts - any posts that are due today or tomorrow. 2-Week look ahead - posts with due dates within the next two weeks. Drafts - created by you or others at your company. Marked void (web only) - any posts that have been marked Void by you or your team. You can reactivate them from the web. Focus keeps your attention on work that is due soon or past due - whether it's assigned to you or assigned by you - without having to search for it. Work that you or your team has been assigned that’s due soon or past due. Work that you've assigned to someone else that is due soon or past due. Work that is finished and ready for your review. Unread updates you might have missed. You’ll see the summary count of posts in each category, and you can tap the Focus notification to view all of those posts in full detail. Pulse is a tool that helps you see how your team’s tracking on tasks -- all at a quick glance. 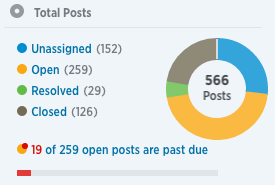 You’ll get a live look at post counts along with their status: Unassigned, Open, Open and Past Due, Resolved and Closed. You'll find Pulse along the right sidebar on the web app -- below Focus. You can tap on any status to view the matching posts in full detail. 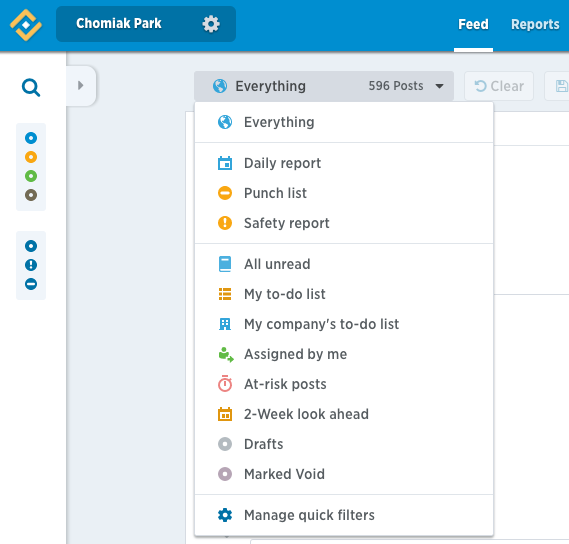 Pulse also bubbles up the posts that are trending, letting you know which people, tasks, topics, and jobsite locations need your attention most. 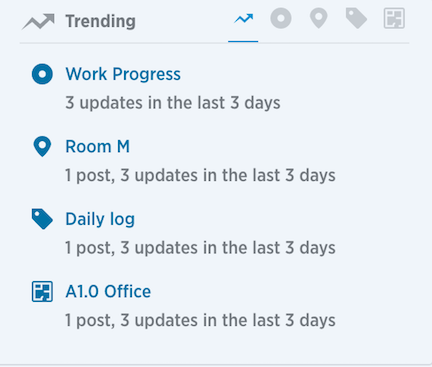 Like post status, you can click on any of these trending posts to get a list view of what's experiencing the most activity on the job. You can also custom filter your project Feed in your mobile or web app -- isolating the exact info you're looking for. At any time, drill down to a specific project location, category, assignee, due date and more. On your mobile device you'll access the filters from the top left by clicking the magnifying glass. Once in the Search & Filter Panel, choose what filters you wish to apply -- for example, filter by post status or assignees and due dates. You'll find the filter options on the web app to the left of your Feed -- all via a slide-out toolbar. Once you've made your selections, you'll have the option to save the filter and access it easily later. We're all familiar with search functionality from Google and our email platforms. Fieldlens also offers the ability to search any project for specific information. On web or mobile, just look for the magnifying glass, type in your keywords, and search away.